Accurate CW and Peak Envelope (PEP) field power measurement over 450 kHz to 2.7 GHz and 100 mW to 10 KW. Uses industry standard Bird 43 elements. Rugged metal housing for the most demanding environments. 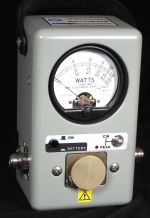 The Bird 4314B Wattmeter is similar to the Bird Model 43 Thruline Wattmeter but also contains electronic circuitry to accurately measure peak envelope power which is present in amplitude modulated signals such as AM broadcast, single sideband and TV video transmitters. The circuitry operates from 2 standard 9V alkaline batteries or an optional A.C. adaptor. 1.5us (26-99 MHz) and 15us (2-25 MHz); repetition rate 30 pps and duty factor 1 x 10^4min.